Travel the iconic waterways of Europe onboard a luxury Scenic Space-Ship, and experience all-inclusive river cruising like never before. 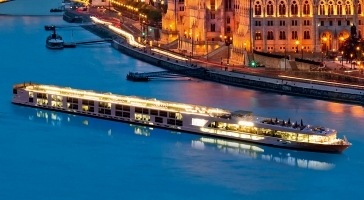 From unforgettable excursions, fine dining and complimentary beverages throughout your cruise, to the luxury extras you’d expect to pay extra for; our innovative approach to all-inclusive travel means everything is included in the price of your river cruise. Scenic have truly gone to the Nth degree to ensure your complete comfort and wellbeing, and because there are no hidden extras, you can afford to leave your wallet at home. Step aboard one of their 5-star luxury Space-Ships, and enjoy all the benefits of their award winning all-inclusive service. They’re committed to ensuring you enjoy the journey of a lifetime, and their transparent approach to inclusivity reflects this — helping you to make the most of this once-in-a-lifetime voyage without the fear of a big bill at the end of your holiday.